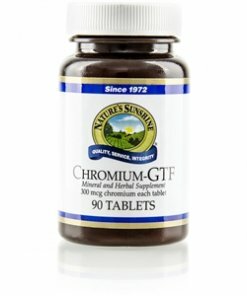 Nature’s Sunshine Chromium GTF assists in regulating already normal blood sugar levels. GTF, or glucose tolerance factor, is a trace mineral that is similar in nature to hormones. Insulin and GTF likely work hand in hand to convey glucose to the cells. The central atom of GTF is chromium, a nutrient used by the liver in production of fatty acids, lecithin, cholesterol, and lipoproteins. Though once found naturally in foods, modern food processing often decreases chromium content in modern diets. Chromium may assist in regulating blood fat levels and in supporting liver filtration. 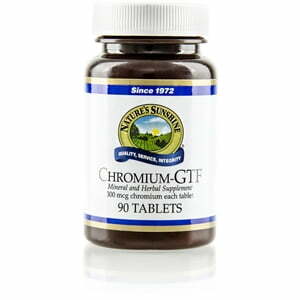 GTF Chromium comes in 500mg capsules consisting of chromium amino acid chelate and chromium nicotinate. The formula’s base consists of horsetail herb, red clover tops and yarrow flower.